Dethleffs' Globebus i4 is marketed as a compact A-class Globebus. The kitchen is very compact and without much prep space, the glass covers will need to be used prudently. The two single fixed beds in the rear can be converted to a double with a few squabs. 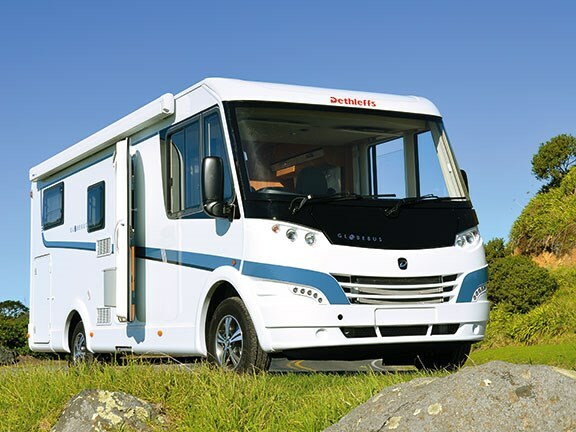 A guaranteed head-turner, Dethleffs’ new Globebus i4 is a stylish motorhome that’s easy on the eye. The best views, however, are from behind the wheel – looking through the glorious, panoramic windscreen. 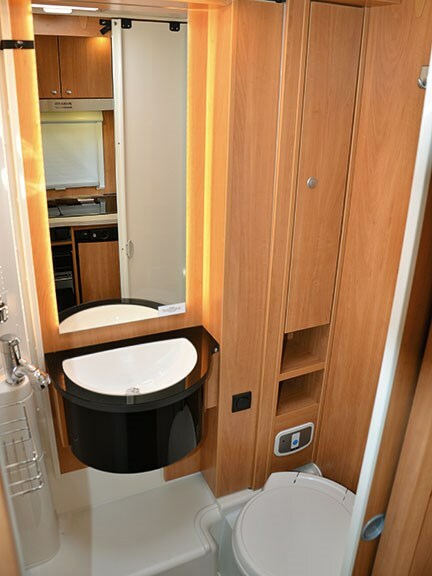 Dethleffs' standard range of A-class Globebus motorhomes has become synonymous with top-seller status — they are among Europe's most popular tourers — sleek, well-appointed vehicles that are beautifully finished. Their dimensions, however, can be a little intimidating, especially for newbies. 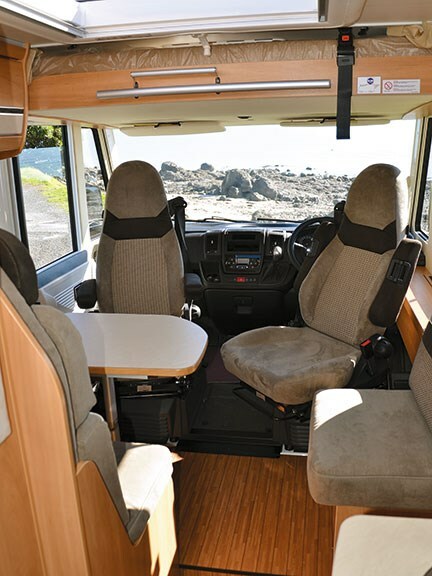 First introduced in 2013, the i4 is marketed as a compact A-class Globebus, and though it's certainly smaller and narrower (2.15 metres) than its plus-sized sisters, it's still an airy, spacious tourer — easily able to accommodate a family of four, or two couples. 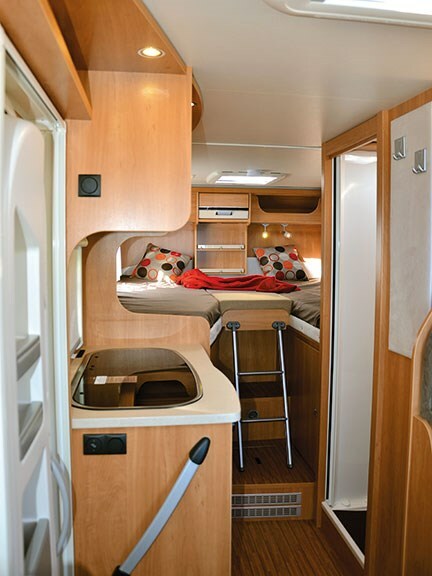 Sleeping arrangements are divided between back and front — there are two, single fixed beds in the rear (converted into a double with a few squabs) and a precision-engineered, drop-down double bed over the cab. Retracted into the roof, you would never know it was there. There's a compact kitchen in the middle (far side) and, opposite, a swing-wall bathroom with shower, vanity, and toilet. The vanity swings into the toilet area to reveal a fairly generous shower cubicle. The dinette and lounge are further forward. Various other layout options are also available. Our review vehicle is the 2014 model — at this stage the only one in New Zealand. It rides on the popular Fiat Ducato chassis (front-wheel drive) fitted with a turbocharged, 2.3-litre, 150hp engine. It's a pleasure to drive and, as alluded to earlier, the driving experience is one of the i4's best features. 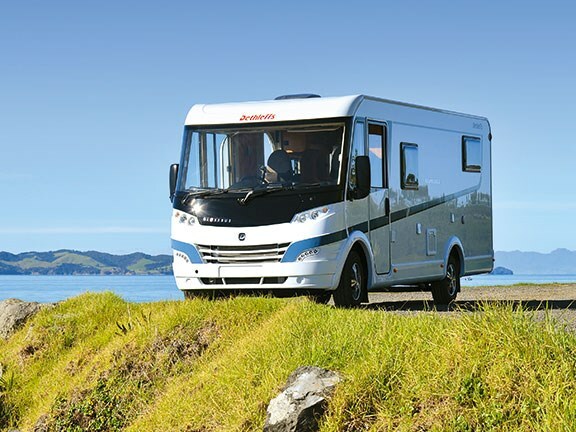 The Fiat chassis is equipped with safety-friendly features such as ABS and electronic brake distribution (EBD) and, compared with many similar-sized motorhomes, the i4's a relative lightweight (it weighs 2911 kilograms, and carries a 588-kilogram payload). 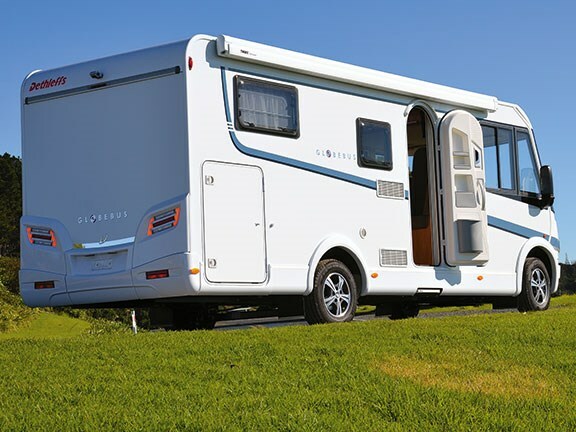 Those vital statistics helped to earn the i4 the Overall Winner Award in 2013 (UK's Practical Motorhome magazine, Motorhome of the Year Awards), as well as the Best Luxury Motorhome under 3.5 tonnes. The i4 is available with a smaller (130hp) engine, as well as a three-litre (180hp) option, but the mid-sized 150hp model is, I think, the appropriate one for us. The smaller engine might labour on New Zealand's undulating roads — the bigger engine will be thirstier. Overall dimensions (2.15 metres wide x 6.75 metres long and 2.67 metres high) are likely to be a big drawcard for potential buyers. It's easy to manoeuver and park, particularly with the excellent visibility and the rear-view camera and dash LCD screen. With a smaller vehicle, it’ll also be mu8ch easier to find parking in the city. 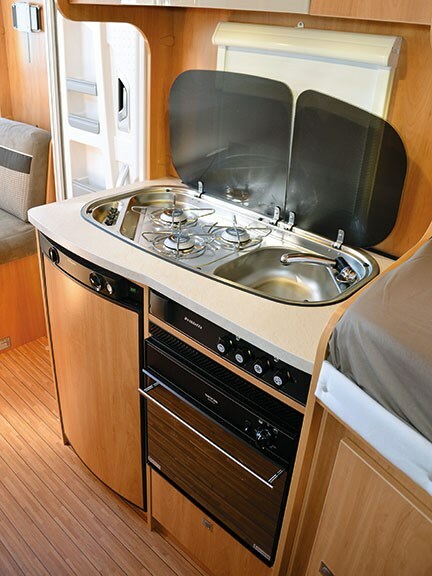 Perhaps the weakest part of the i4's design, the kitchen is relatively compact and comprises a one-piece, stainless steel unit (sink/three-burner gas hob) dominating the benchtop. It doesn't leave much extra space and for food preparation you'll have to use the fold-down glass covers prudently. Below the benchtop is an oven/grill and a 100-litre fridge (with a nine-litre freezer). There's good storage in overhead lockers. The dinette (opposite and further forward) is much more spacious and the table's surrounded by two, two-seater benches (one facing forward, one on the side). The fully-swivelling front seats (comfortable, high-back models with twin armrests) can also be incorporated into the seating plan — making for a cosy, intimate dinner for six. Immediately behind the dinette is the bathroom with its clever use of a swing-wall that converts the vanity/toilet into a shower cubicle. You'll have plenty of locker storage in the vanity. 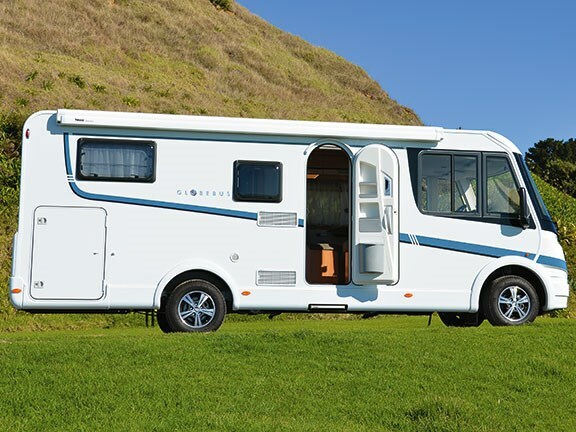 If you're into winter touring, you'll take heart from the grunty Truma Combi E6 (six kilowatt) gas-fired heating system — it also feeds the 10-litre hot water cylinder. The i4 carries 114 litres of water, with a 90-litre grey tank. 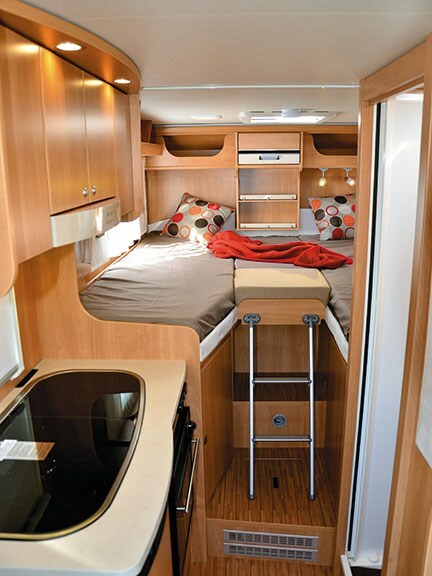 As is standard with Dethleffs, the Globebus is equipped with a number of practical, cleverly-designed features. My favourites are the drop-down double bed above the cab and the large garage at the rear (under the two single beds). 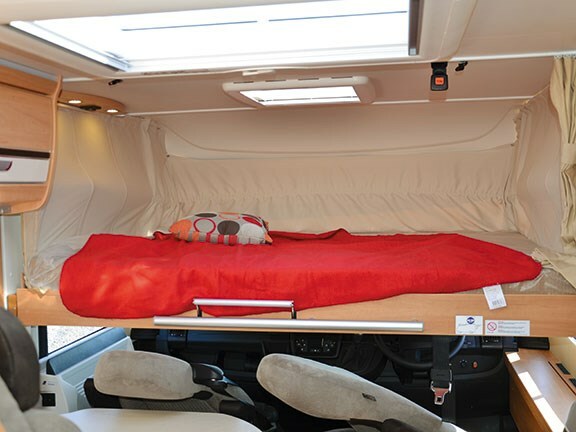 To deploy the over-cab bed, you fold forward the backrests of the two front seats and simply pull the bed down. It's an effortless operation, and the supplied ladder provides easy access. The bed's surprisingly spacious (180cm x 150cm) and, as the TV is mounted nearby (against the far wall), you can easily watch your favourite programme from bed. Those sleeping in the rear will miss out, unfortunately. The garage is accessed from a single door (rear, driver's side), and it will easily swallow three or four adult bikes — a treat for those who dislike rear-mounted bike racks. Given the i4's 588-kilogram payload, that garage will be very useful for all sorts of accessories and toys. I also like the lighting system — LED lights mounted on tracks. This makes it easy to customise the lighting to your specific preferences. The standard i4 is equipped with a single 95-amp-hour house battery but the local agent has added a second — a sensible move. The combination of that large front windscreen and overhead skylights creates a very light, airy interior. At night, when you'll want some privacy, draw the concertina blinds — they're fitted to every window, including the windscreen. 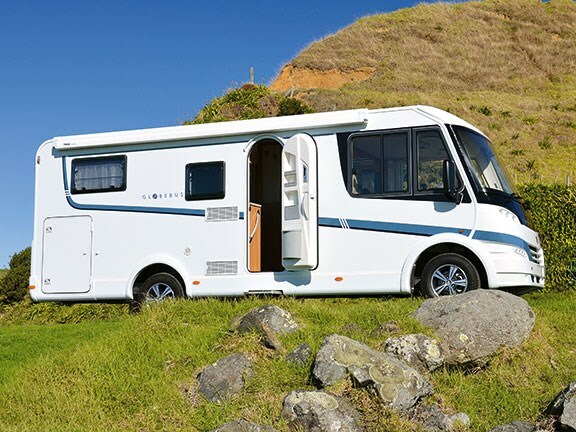 Those who've explored other Dethleffs motorhomes in New Zealand will be familiar with the marque's slight oddity in terms of entry. 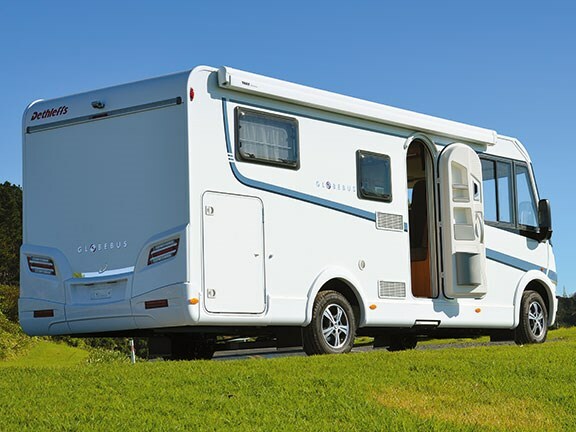 Manufactured for left-hand drive European markets, the main entry to the motorhome is on the opposite side from the driver. Vehicles imported to our shores have the steering switched to the right, but the standard layout remains, hence the main entry located on the driver's side. In itself, this is not really a problem and I guess you soon get used to it. But I'm not crazy about the lack of a driver's door — you use the main entry or the passenger door (what is the European driver's door). Perhaps it's a case of 'it's difficult to teach old dogs new tricks', but every time I stop I find myself reaching for a non-existent door lever. Again, you'll probably get used to it fairly quickly. If you can live with those idiosyncrasies and you're not a particularly adventurous chef, the Globebus i4 is excellent proposition and, thanks to our rampart dollar, good value for money. In standard trim it's priced at $145,000. Add another $4000 and you'll get the following extras: a 4.5-metre Thule awning, a 190-watt solar panel, a 19-inch TV with an Apollo Sat Dome, as well as a seven-inch Phillips GPS unit linked to the rear-view camera. 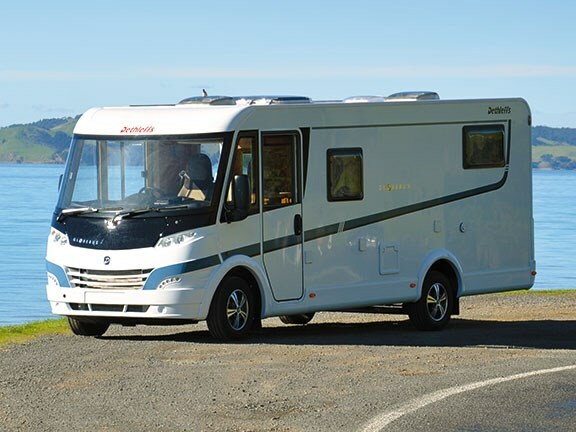 For the latest news and reviews, subscribe to Motorhomes, Caravans & Destinations magazine here.